by Miller, Roger LeRoy; Benjamin, Daniel K.
For principles of economics and social issues courses. 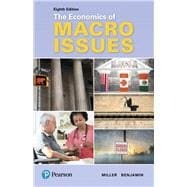 The Economics of Macro Issues is a collection of brief, relevant readings that spark independent thinking and discussion in principles of economics and social issues. The text encourages readers to apply theoretical discussions to today’s important issues to gain a deeper understanding of current macroeconomic policy concerns. The 8th Edition addresses critical new macroeconomic policy issues with timeliness and insight. And it showcases pivotal developments in American economic affairs and policy making in the past few years, in ways that will both challenge and enlighten readers at all levels. Daniel K. Benjamin is an Alumni Distinguished Professor in the John E. Walker Department of Economics, Clemson University. 7. What Should GDP Include? 16. Is It Real, or Is It Nominal? 17. Can We Afford the Affordable Care Act? 18. Who Really Pays Taxes? 19. Are You Stimulated Yet?